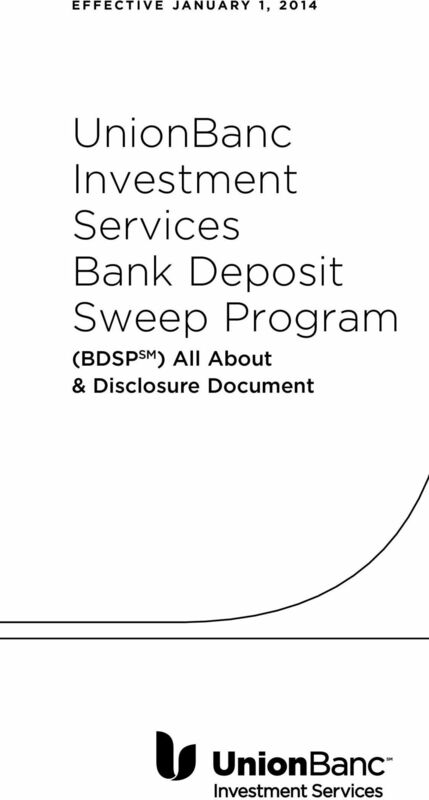 Download "UnionBanc Investment Services Bank Deposit Sweep Program"
2 BDSP Summary This section highlights certain key features of the Bank Deposit Sweep Program (also referred to as BDSP or BDSP SM ). 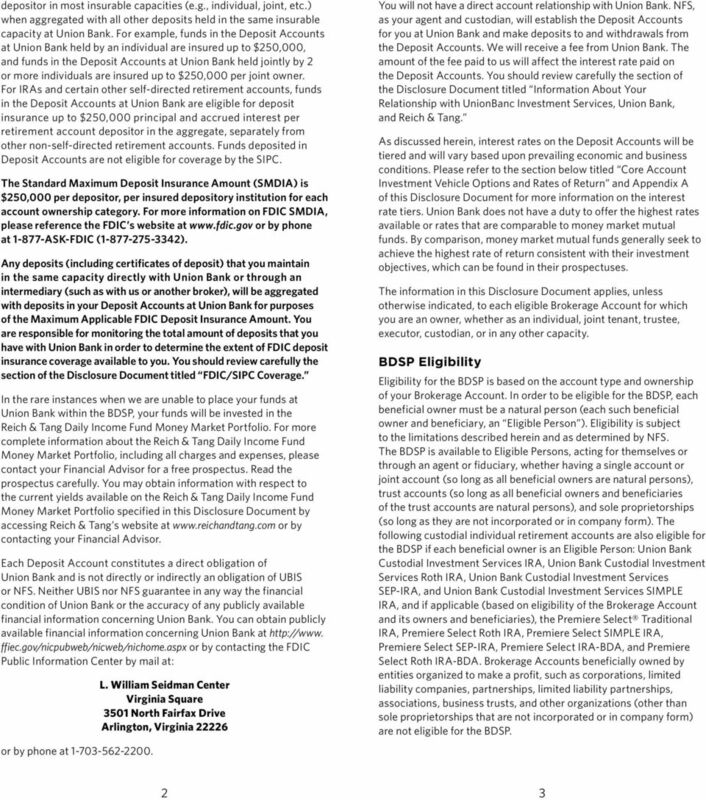 Please read this complete Disclosure Document if you elect to participate in the BDSP. 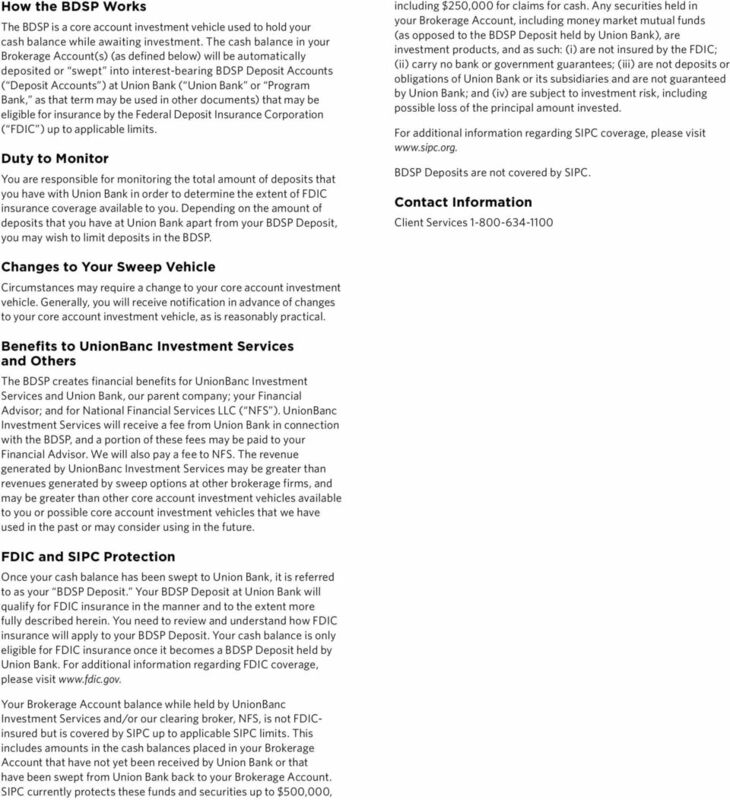 You should consult UnionBanc Investment Services LLC or your Financial Advisor for more information. 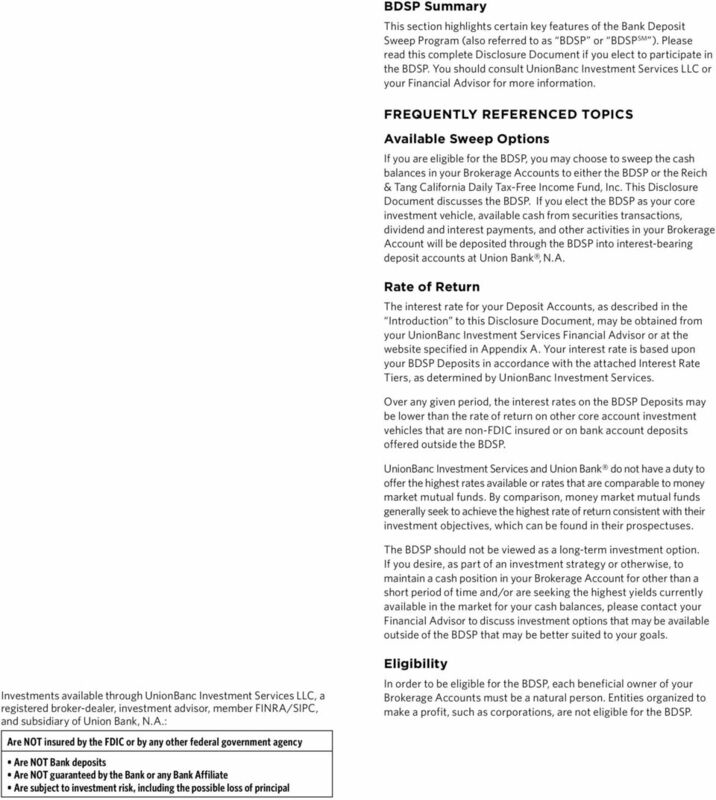 Frequently Referenced Topics Available Sweep Options If you are eligible for the BDSP, you may choose to sweep the cash balances in your Brokerage Accounts to either the BDSP or the Reich & Tang California Daily Tax-Free Income Fund, Inc. 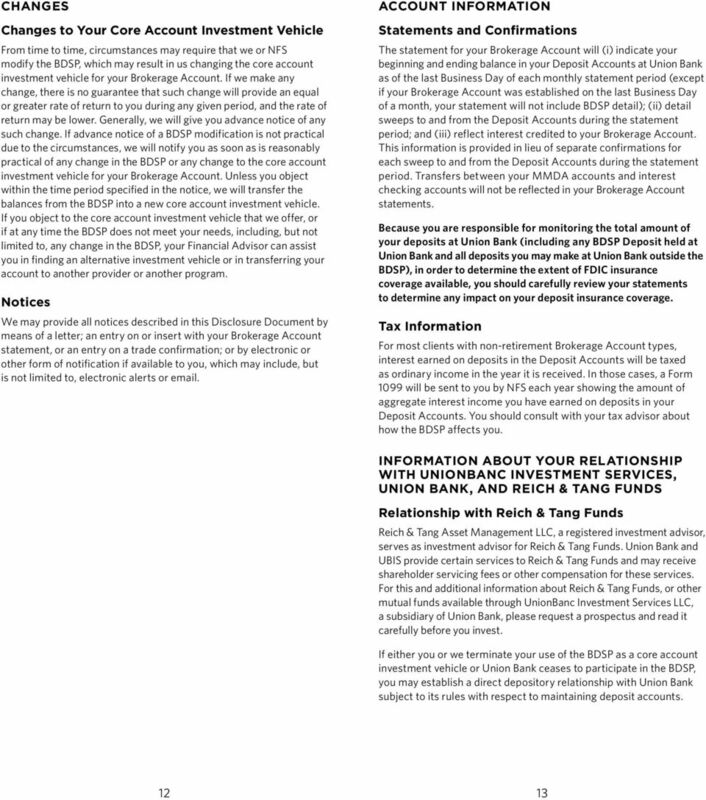 This Disclosure Document discusses the BDSP. 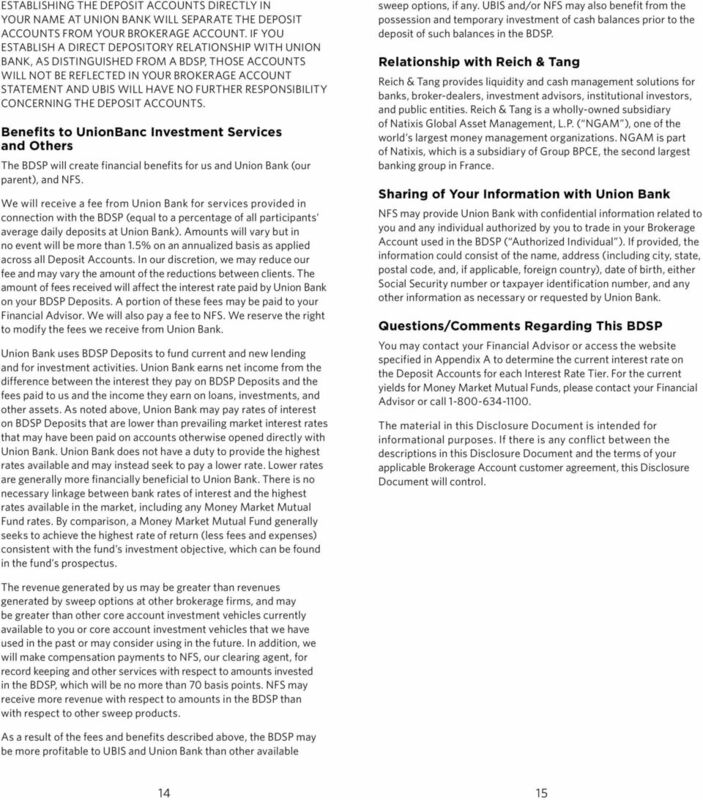 If you elect the BDSP as your core investment vehicle, available cash from securities transactions, dividend and interest payments, and other activities in your Brokerage Account will be deposited through the BDSP into interest-bearing deposit accounts at Union Bank, N.A. 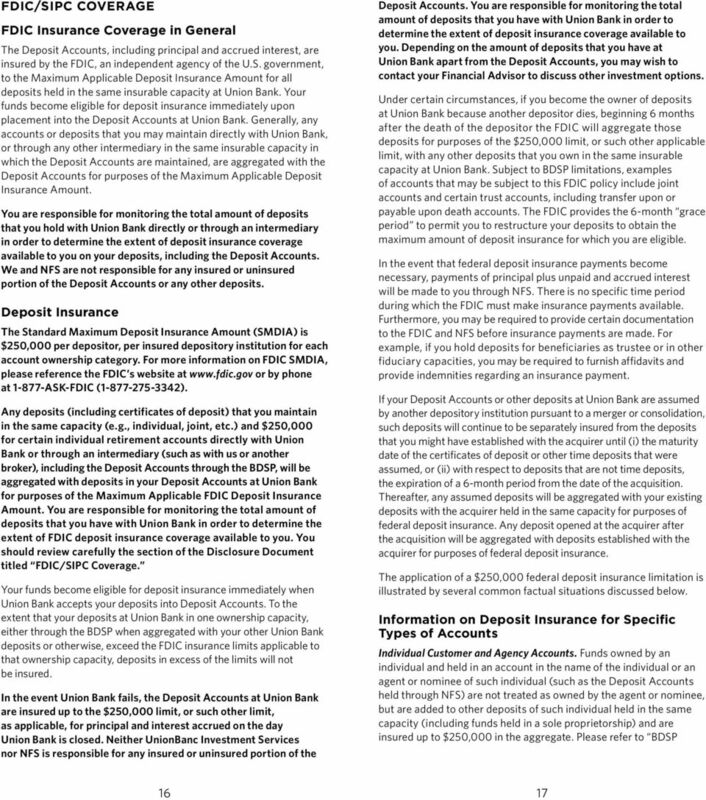 Rate of Return The interest rate for your Deposit Accounts, as described in the Introduction to this Disclosure Document, may be obtained from your UnionBanc Investment Services Financial Advisor or at the website specified in Appendix A. 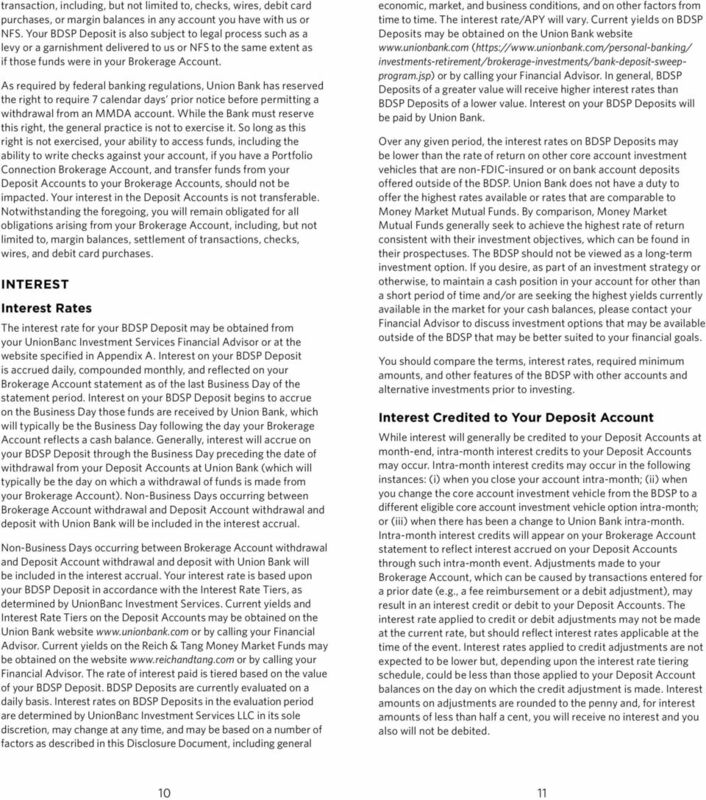 Your interest rate is based upon your BDSP Deposits in accordance with the attached Interest Rate Tiers, as determined by UnionBanc Investment Services. 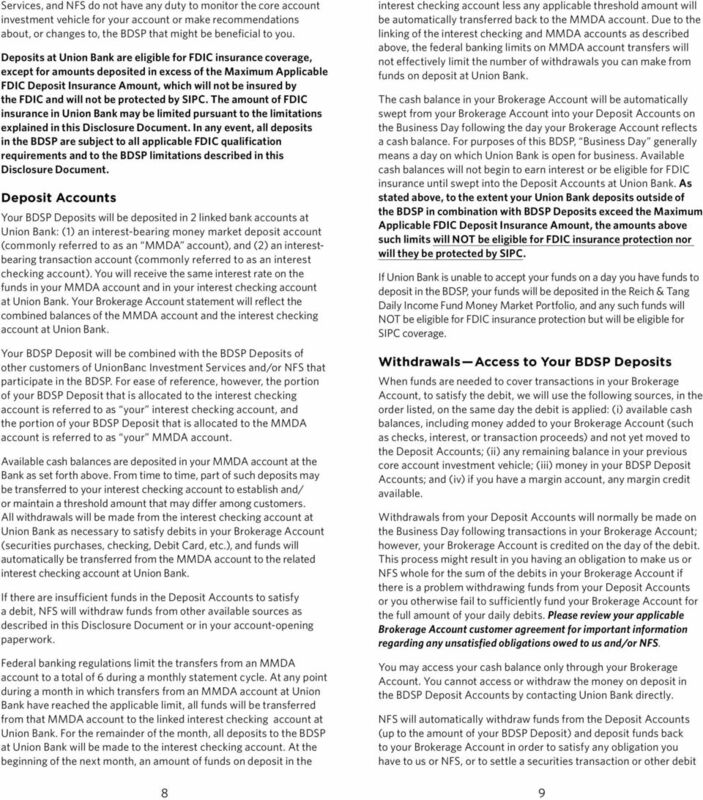 Over any given period, the interest rates on the BDSP Deposits may be lower than the rate of return on other core account investment vehicles that are non-fdic insured or on bank account deposits offered outside the BDSP. 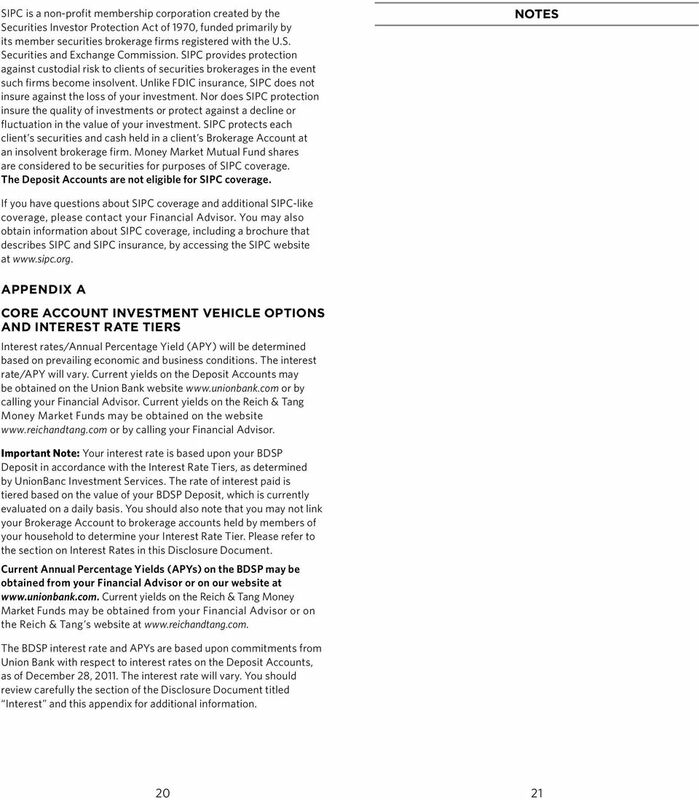 UnionBanc Investment Services and Union Bank do not have a duty to offer the highest rates available or rates that are comparable to money market mutual funds. By comparison, money market mutual funds generally seek to achieve the highest rate of return consistent with their investment objectives, which can be found in their prospectuses. 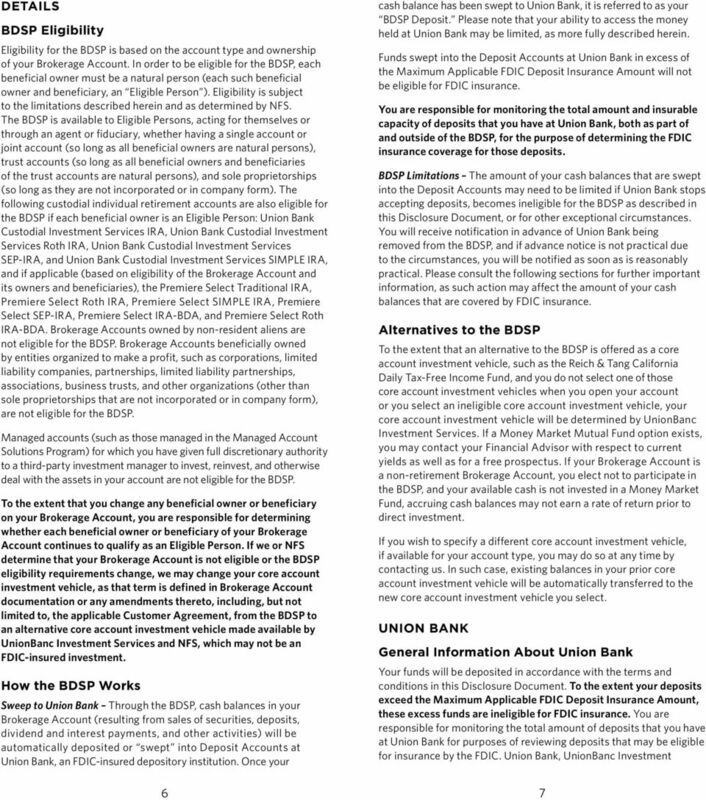 The BDSP should not be viewed as a long-term investment option. 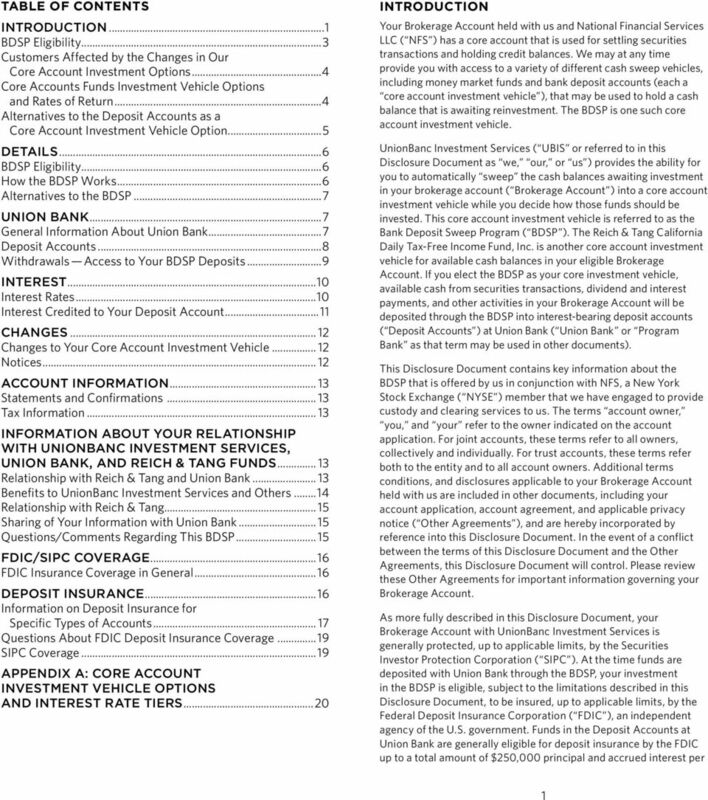 If you desire, as part of an investment strategy or otherwise, to maintain a cash position in your Brokerage Account for other than a short period of time and/or are seeking the highest yields currently available in the market for your cash balances, please contact your Financial Advisor to discuss investment options that may be available outside of the BDSP that may be better suited to your goals. 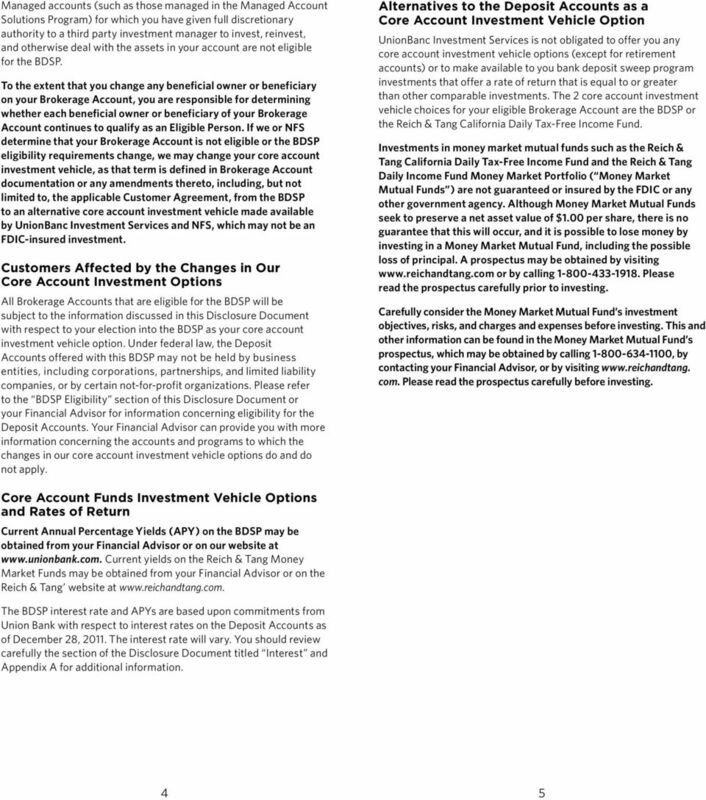 Investments available through UnionBanc Investment Services LLC, a registered broker-dealer, investment advisor, member FINRA/SIPC, and subsidiary of Union Bank, N.A. 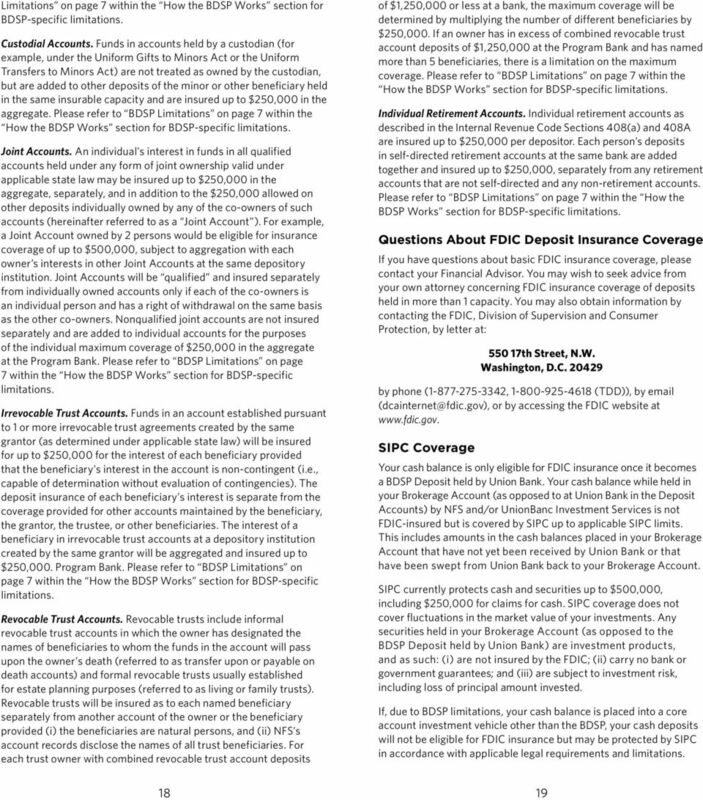 : Are NOT insured by the FDIC or by any other federal government agency Are NOT Bank deposits Are NOT guaranteed by the Bank or any Bank Affiliate Are subject to investment risk, including the possible loss of principal Eligibility In order to be eligible for the BDSP, each beneficial owner of your Brokerage Accounts must be a natural person. Entities organized to make a profit, such as corporations, are not eligible for the BDSP.